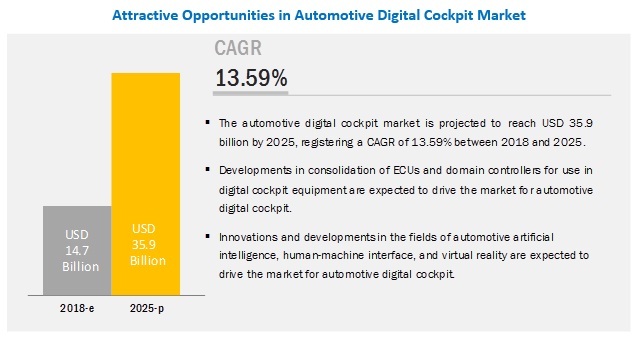 [151 Pages Report] The automotive digital cockpit market is estimated to be USD 14.7 billion in 2018 and is projected to reach USD 35.9 billion by 2025, at a CAGR of 13.59% during the forecast period. Increasing number of connected vehicles and innovations in the field of vehicle human machine interface are projected to drive the automotive digital cockpit market. The passenger vehicle segment is estimated to hold the largest market share. The rising demand for connected car features in passenger vehicles and the advent of semi-autonomous and autonomous vehicles are expected to drive the market growth in this segment. OEM’s push towards offering an enhanced user experience to their customer has also boosted the demand for a digital cockpit. The automotive digital cockpit market in the Rest of the World (RoW) is estimated to grow at the highest CAGR during the forecast period. Developing countries such as Brazil and Iran have witnessed increased consumer demand for advanced user experience in vehicles. OEMs are promoting digital cockpit functions as some of the most advanced features. The increasing adoption of these features in mid-priced and economy segment passenger cars is expected to fuel the growth of the automotive digital cockpit market in the RoW region. The key players in the automotive digital cockpit market are Visteon (US), Continental (Germany), Robert Bosch (Germany), Denso (Japan), and Clarion (Japan). Visteon is anticipated to be a dominant player in the automotive digital cockpit market. Visteon adopted the strategies of new product development, partnership, and mergers & acquisitions to retain its leading position in the automotive digital cockpit market. The company strengthened its product portfolio and increased its global presence by building customer relationships. It has also increased its presence in emerging markets such as India. In January 2018, Visteon showcased modern technology for the digital cockpit for autonomous driving at CES 2018. The company introduced its DriveCore autonomous driving controller, which is a hardware/software platform that enables automakers to build an autonomous driving solution in an open collaboration model. In January 2017, Visteon demonstrated an AR HUD at the CES in the US. The new interface provides driver information on the HUD and projects virtual images of the street and street obstructions on the windshield for the driver. In October 2018, Continental revealed an industry-first full-color demonstrator of an automotive-specific Head-up Display (HUD) based on waveguide technology. This demonstrator is the result of the joint development with DigiLens. The Continental AR-HUD with waveguide technology significantly reduces the packaging size. With this new, innovative technology, Continental achieves an augmentation area of 15° x 5° (= 2.60 m x 0.87 m at a projection distance of 10 m) while bringing down the device size to a mere 10 liters magnitude. Continental´s demonstrator enables augmentations within a field of 2.60 m x 0.87 m at a projection distance of 10 m and solves the previous size issue of the AR-HUD. Autonomous vehicles are questioning the existence of a steering wheel and conventional cockpit. What does this mean for the automotive cockpit industry? Can an open-source instrument cluster or infotainment satisfy safety-critical functionality required by automotive? HUD is the most attractive feature of a digital cockpit. How do companies plan to tap into this opportunity? What should be the go-to-market strategy for digital cockpit manufacturers to promote and expand the digital cockpit technologies in developing countries where the market is at a nascent stage? The study involves four main activities to estimate the current size of the automotive digital cockpit market. Exhaustive secondary research was done to collect information on the market such as the use of digital cockpit in various equipment and vehicle types. The next step was to validate these findings, assumptions, and market analysis with industry experts across value chains through primary research. A bottom-up approach was employed to estimate the complete market size of different segments considered in this study. The secondary sources referred to in this research study include automotive industry organizations such as the Organisation Internationale des Constructeurs d'Automobiles (OICA); corporate filings (such as annual reports, investor presentations, and financial statements); and trade, business, and automotive associations. Secondary data has been collected and analyzed to arrive at the overall market size, which is further validated by multiple industry experts. Extensive primary research was conducted after acquiring an understanding of the scenario of the automotive digital cockpit market through secondary research. Several primary interviews were conducted with the market experts from both demand- side (OEM) and supply-side (automotive digital cockpit providers) across 4 major regions, namely, North America, Europe, Asia Pacific, and the Rest of the World (RoW). Primary data was collected through questionnaires, emails, and telephonic interviews. In our canvassing of primaries, we strived to cover various departments within organizations, which included sales, operations, and administration, to provide a holistic viewpoint of the automotive digital cockpit market in our report. After arriving at the overall market size-using the market size estimation processes as explained above—the market was split into several segments and sub-segments. All parameters that are said to affect the markets covered in this research study have been accounted for, viewed in extensive detail, and analyzed to obtain the final quantitative and qualitative data. This data has been consolidated, enhanced with detailed inputs and analysis from MarketsandMarkets, and presented in the report. The data was triangulated by studying numerous factors and trends in the demand and supply sides in the automotive digital cockpit market. This research report categorizes the automotive digital cockpit market based on equipment, vehicle type, electric vehicle type, and region.